Like most young couples, Jared and Jordan were tired of paying rent, but . they were not quite ready for a mortgage just yet. One night, they were watching the movie “Captain Fantastic.” The movie about a family who lived a nonconventional life inspired them and soon, they were talking about converting a school bus and making it their home. 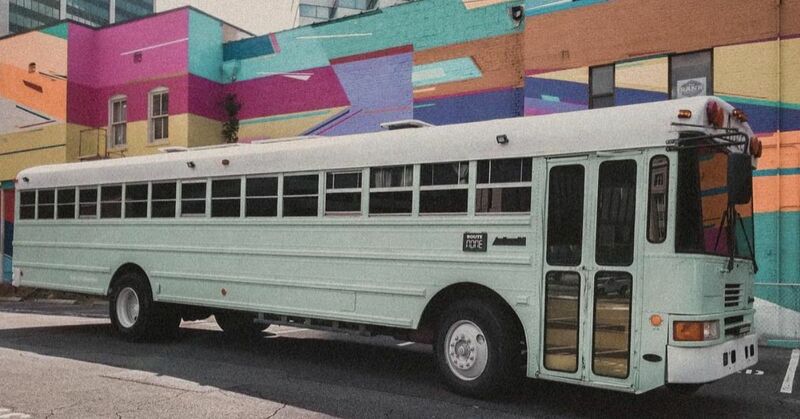 The following day they bought a 40-foot 2000 International Harvester Bus they saw on Craigslist in Dallas and started working on it immediately. They have always been interested in tiny living but their end goal was to travel. Buying a bus and converting it to an RV was the perfect solution. Jared works as a freight broker and Jordan is a technical writer. Because they both work remotely, this allows them to travel whenever they want. They describe the style of their home as a mixture of bohemian, vintage and rustic. Insulation is an essential process in the beginning stages of converting a bus. The couple used RMax Thermasheath, which also helps soundproof their new home. Jared and Jordan each wanted a different color for the bus, but in the end, they reached a compromise. They ended up choosing “Kind Green” from Sherwin-Williams. They are both fans of Harry Potter, so Jordan tried very hard to convince Jared to give their bus a name that was related to the book. But when Jared suggested the name Alice, Jordan immediately thought it was perfect. "Alice in Wonderland" also happens to be one of their favorite adventure stories. A bright pop of color at the entrance adds an extra bit of warmth to any home. By using a mixture of plain and patterned fabrics for the sofas, a lot of assorted throw pillows and a decorative rug to serve as divider, the couple’s entertainment area comes alive with a charm and character of its own. It might be small, but the kitchen has everything the couple needs to prepare meals. They got the Cusimax stove top from Amazon while the Oster convection oven was from Walmart. The refrigerator is Magic Chef. They freed up counter space by using a mesh basket for stowing fruits and vegetables. Having assorted pots of herbs by the window sill is both practical and decorative. This spot in the house is proof that small doesn’t automatically mean limited functionality. The couple does a lot of activities at this dinette and has grown to love it. When it came to the bathroom, the couple decided to put in tile to update the floor. The couple decided to use a whiskey barrel in the shower area, giving it a very rustic feel while saving on space. The couple originally just had Olivia as their pet but they eventually got Evelyn so Olivia would have someone to play with when they are not in the bus. Living on the road means meeting other people who share the same lifestyle as you. Jared and Jordan have enjoyed sharing stories with other people just like them.